VIP Apartment: the absolute combination of elegant living and natural beauty. In Kardamyli, in the Messinian Mani region of the Peloponnese. Katikies Manis is 37k from Kalamata airport or 2 hours and 45 minutes by car from Athens. 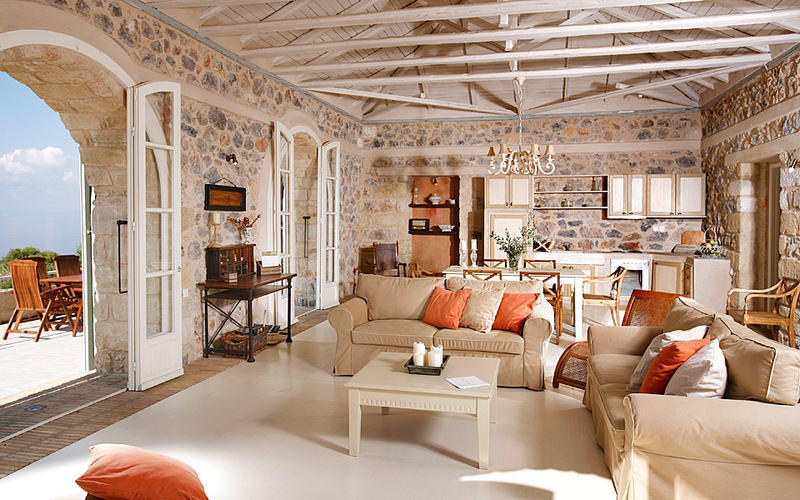 Katikies Manis (or “Mani Homes”) consists of four luxurious apartments located near Kardamyli, a small and picturesque coastal village ideal for vacationers seeking tranquility and privacy. Built in rustic style with natural materials such as stone and wood, the property is surrounded by a large estate with olive trees, thus blending perfectly with the natural surroundings. The atmosphere of Superior Apartment offers tranquility and privacy. Each of the four apartments have private balconies overlooking the sea. The Superior Apartment is open plan with shower/toilet, fully equipped kitchen, living room with a fireplace and an elevated bedroom. The Deluxe Apartment has a separate bedroom, dining room, spacious living room with a fireplace and a double sofa-bed. The VIP Apartment features a master bedroom with its own separate bathroom (with bathtub), a second bedroom, as well as an additional bathroom with a shower, a large living room with a fireplace and two double sofa-beds, a fully equipped kitchen and dining room. Finally, the mini Maisonette comprises an open plan living room and kitchenette (fully equipped), shower/toilet, and an internal spiral staircase to an elevated bedroom. All apartments feature air-conditioning, complimentary internet access, a CD/DVD player, safe box, hairdryer and special bathroom amenities. A daily cleaning service and parking are also available. Upon arrival, guests are offered a welcome basket of produce for their breakfast as well as wine and fresh fruit. All guests have access to the garden, which features a barbeque and an open-air sitting area for sunbathing and relaxation. There are two beaches located just 200m away from the estate: the charming Delfinia (both pebbled and sandy) and the impressive Foneas (pebbled).